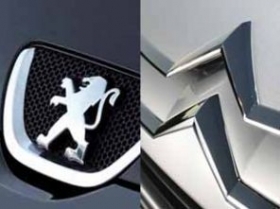 For French President Francois Hollande's government, PSA/Peugeot-Citroen's decision to close a factory and eliminate jobs has gone from "unacceptable" two months ago to "inevitable" now. In July, Hollande said in a televised interview that PSA's plan to cut 8,000 jobs and shut its Aulnay plant near Paris, "is not acceptable in its current form." On Tuesday, a report commissioned by his Industry Ministry said that given the flat European car market and PSA's overcapacity, "the group must absolutely cut costs" and "the closing of an assembly line is inevitable." The shift marks an about-face for Hollande, who was elected in May on a pledge to prevent a "parade of firings." Since then, the number of unemployed in France has passed 3 million to hit a 13-year high as companies from Air France-KLM Group to retailer Carrefour SA have announced layoffs. "From a shareholder point of view, it's a good thing that the government acknowledges PSA is facing a fixed-cost problem," said Sascha Gommel, an analyst at Commerzbank. "Their initial reaction was typical. You can see that in any country, when you close a plant, you immediately have a political backlash." Industry Minister Arnaud Montebourg said in a meeting with PSA union officials on Tuesday that the company was "facing severe difficulties and needed to restructure," according to Franck Don, a CFTC PSA union official. The Paris-based company's automotive division has been burning through 200 million euros in cash a month for the last year, CEO Philippe Varin said in July as the company reported an 819 million euro ($1.05 billion) first-half net loss. PSA has been hurt by its dependence on the Italian and Spanish markets, which have been battered by the euro-zone debt crisis, and its slowness in expanding internationally. The carmaker also has too much production capacity and is squeezed between mass-market competitors building cars in countries with lower costs, such as in eastern Europe, and premium German automakers attacking the middle-range market. "The internationalization strategy started too late," Pierre-Olivier Salmon, a PSA spokesman, said by phone. "That's what Philippe Varin reckoned as soon as he became CEO. He said the group was too European and too middle-range. That's why we're upgrading and becoming more global." PSA has invested 250 million euros since 2009 in a Madrid plant that might have been a better candidate for closure than Aulnay, according to the report. The Spanish plant "suffers from numerous flaws," including being old, with low capacity and being far from its suppliers, the report added. "Looking back, the management of PSA lacked realism in setting its targets," the report said. "Until the middle of the last decade, it was targeting an annual production of 4 million cars, whereas it never managed more than 3.6 million." The Aulnay plant ran at 56.7 percent of its capacity in 2011, with anything under 65 percent considered under-utilization, the report added. The need for PSA "to re-organize its industrial activities and to reduce its work force is, sadly, not contestable," the report said. PSA employed 81,324 people in France at the end of 2011, out of a worldwide workforce of 122,879. The company last week was pushed out of France's benchmark CAC 40 stock index after its shares declined more than 60 percent in 12 months, giving it a market value of 2.3 billion euros. PSA's restructuring is aimed at breaking even in terms of operating cash flow by 2014, at which point the report said a recovery in the European car market was hoped for.